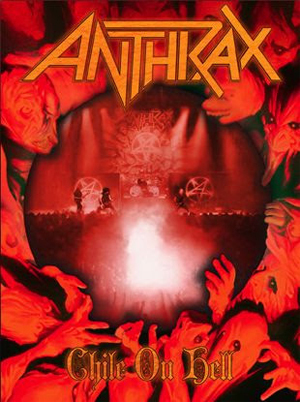 On September 15, 2014, members of the media gathered at the Downtown Independent Theater to watch the Los Angeles premier of ANTHRAX’s new DVD, Chile in Hell. The big screen airing of the video took place a day before its official release (9/16/2014). ANTHRAX guitarist Scott Ian and renowned producer/mixer Jay Ruston were on hand after the screening to answer questions about the film. Chile On Hell was shot in Santiago, Chile, a locale chosen by the band for its enthusiastic fans. The DVD rivals any live concert video on the market with its multi-camera footage, shot from numerous angles. The visuals are incredible, as is the audio quality, thanks to Ruston, whose numerous album credits include STONE SOUR, KILLSWITCH ENGAGE, STEEL PANTHER, to name a few, and the The Big 4 (METALLICA, SLAYER, MEGADETH, ANTHRAX) live DVD. Ruston also produced and mixed ANTHRAX’s Worship Music (2011) and Anthems (2013). The video, which runs approximately one hour and 50 minutes, shows some of the craziest fans in the world going off. How they got road flares into the venue is stupefying, and watching the flares alight and waved around in the circle pit like Fourth of July sparklers is funny and horrifying at the same time. The band played on, nonetheless, and according to Ian, fire extinguishers were snuck into the venue as well.